Ansted lives and works between Australia, Belgium and Germany. To be confronted by a puzzle can be at once both a charming and an intimidating experience. A puzzle is a test of intelligence, a quality that though always important, has become increasingly valued. A puzzle tests us, and the outcome must be unambiguous—indeed in ancient Greek and Roman mythology, a wrong answer could mean death. But the charm of puzzles is also alluring. A maze is a visual puzzle that has its own beauty, but for Theseus, the Labyrinth was also a life testing experience. Darryn Ansted presents a series of paintings in this exhibition Aspects of a Puzzle that engage with an architectural motif that appears both modernist and suburban. The colours and light that infuse these landscapes is pleasant and is recognisable as a West Coast phenomenon, familiar in both America and Australia. Titles such as Limelightand Magnolia further impress, with this feeling that ‘everything is fine’, but is this an allurement into the trap of the puzzle? We are also enticed into puzzles by clues. The Minotaur inhabited a Labyrinth, in the myth, which was designed by the architect Daedalus, who also designed a hollow dummy cow in which Pasiphaë could hide to consummate her love for a beautiful white bull. The Minotaur is the monster love child, half bull, half human, imprisoned in the Labyrinth until he is eventually slain by the hero, Theseus. Such was the fate of monsters, for whom there was no compassion. The maze was so difficult to escape from that Theseus was given a ball of thread (called a ‘clew’) to use to find his way back out. This is an etymological root of the modern word ‘clue’, which we need to navigate our way out of a puzzle. What are the clues that Ansted gives us in his paintings? A lemon on a table and a figure providing clues for the scale of the spaces represented in the paintings. There is perspective also (another clue), indicating that these may be real spaces, but something warns us that this belief is a trap. The sense of unreality is also ubiquitous in these works. A tiny figure gazes on a glass and stone monolith framed by geometric clouds. If de Chirico had lived in San Francisco or Perth, this is the strange atmosphere he may have painted. But he didn’t live in either of these places, so this too may be a distraction or red herring rather than an actual clue. At some point in an exhibition, as in the Labyrinth, we turn a bend to find something that may overpower us. Painting exhibitions always find their final form as a sequence within an architectural setting and in this case there is architecture inside architecture. Around a corner, somewhere in this exhibition, can we expect a major work that puts all our fears and insecurities about our intelligence to the true test? Is this for instance in the massive Garden, where a cube on a table reminds us of the shared artifice of both puzzles and paintings? Is this the clue that lets us safely out of the maze with our reputations intact—or another allurement? Or, it may be in the earlier, small, beautifully simple, abstract works such as “Umber” or “Ochre” that provide a ‘clew’, stripped of portent, showing the path in, in order to indicate the way out. Aspects of a Puzzle provides just that, different views of the unnamed problem. There is no ultimate conflict point or resolution as in the Labyrinth of Crete. Instead we hover inside one space then glide to the next. Within the presence of these paintings we stay suspended and engaged in their many intriguing qualities. An abiding concern with the underpinnings of painting, as both material and social practice, knits together the diverse series Darryn Thomas Ansted has produced over the last decade. Ansted is an Australian of Irish background, living in Perth and working both there and in Germany, a painter, a teacher and an informed and engaged critic of Gerhard Richter. His is not an Australian painting as such, operating within a local or national school, rather the lines of geography, awareness and interest are blurred. He looks globally, like many contemporary artists, and seeks dialogue with a wider, dispersed and contemporary field of art, painting and ideas. In his early work his fascination (and frustration) with Richter can be clearly seen—he takes on the grids of Richter’s colour charts and rather than deploying them as random arrays Ansted imbues them with alternative content. Subsequently he has moved away from Richter in a continuing effort to ‘redeploy modernist approaches within a context of ethical questioning’. Ansted’s Grids series of 2008–2011 are his clearest rejoinder to Richter, a contemporary painter whose presence is inescapable but which Ansted also challenges. Arbitrariness has always seemed the central problem in both abstract and representational painting. What reason is there, other than some stupid system or the rules of a game, for placing one thing next to another in any particular format, any particular colour, with any particular outline, with any particular likeness—and next to that something else again, no matter what? He has deployed various possible answers to this question—which in its existential and ontological ramifications is fundamentally about any painting, all painting and all art. His point seems apposite for a discussion of Ansted’s grids, and for the dilemmas he continues to explore. Ansted however posits quite different answers, both in his grid works and subsequently. He engaged in a close study of Richter over many years, and completed an Art History doctorate and a related book on his work. He has been both interested and deeply sceptical, seeking alternatives and his own ethically and politically engaged solutions. Richter’s colour charts present a seamless grid of coloured chips, ranging in number from nine to nearly five thousand small rectangles, and the distribution of colours is apparently random. There is no discernible pattern, the grids are seamless (and like all grids potentially infinitely expansible) and arbitrary. There is no overt content, the rules of the game have been played out, and Richter’s references are to an art world and its strategies and endgames. 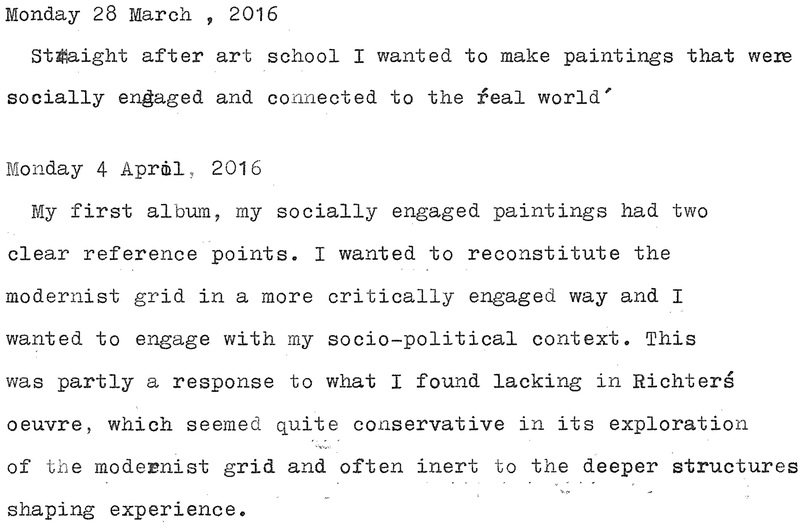 Ansted’s grids deploy a different pixelated grid, one where content is coded and discernible—where arbitrariness is resisted and the goal he seeks is a painting that sits within a ‘broader cultural, social and political context’ and against chance and the ‘inhibit[ion of] painting’s communicative potential.’ His grids are a form of camouflage, with words concealed within them which can gradually emerge into view—Asleep, Occupy, Apathy and others. They take a classically modernist form, the grid used by Richter, Ellsworth Kelly and others, and seem to propose that under all apparent randomness there is content, and all painting comes with politics. There is one outlier in this Grids series, a very different work, Sleeper, 2008 (the first painting within Ansted’s catalogue raisonné). It also evokes Richter, with its near monochromatic and blurred depiction of the face of a person sleeping. The image is turned at an angle on a black ground, like a photograph tossed on another surface and the reclining form is angled toward, but not at, the vertical. The figure and ground are in strange sympathy, with the dark line of the horizon echoing the shadow that delineates the nose. There seems to be a small cloud like breath descending from it, and the lower lip and mouth extend downwards, cutting off the chin and creating a dark edge to the face. The mouth is slightly open, releasing a soft gust and hinting at the quiet movement of an unconscious, sleeping subject—unaware but nonetheless somehow complete. It references, in part, Richter’s Mouth, 1963 and Nose, 1962, which isolate sections of the face, broken from the larger whole or of some totality of being. Richter’s Mouth is cropped into a festishist’s void, encircled by a luscious swirl of lipstick and his Nose shows a monochrome, solid sculptural form delineated by dark smudges. Ansted shows the whole of the face, albeit in black and white and with a characteristic Richteresque blur. Whereas Richter’s paintings for Ansted reflect a ‘psychic fragmentation of subjectivity’ the subject of his own work in Sleeper, while largely colourless, blurred and unaware, is not fragmented or cut into pieces by psychic disorder. His subject is unconscious now, yes, but can be imagined as waking later into some form of whole—she or he is still capable of integrated consciousness. This work, in combination with others in this first series (particularly Asleep 1, 2008 and Sleep, 2011) suggest that the artist who paints an arbitrary grid in some form of ‘ambivalent parody’—who finds little content or context to underlie his grid—may himself be asleep and unconscious. In later series Ansted moves deliberately away from his critique of Richter, through an intensifying concern with the area between objects and structure, figure and ground, things in the outside world, and in the modest possibilities of painting. In much of his work there is an architectonic under layer, drawing and form alluding to architectural space, and a quest for a coherent but subtle politics within his practice. The difficult space between objectivity and arbitrariness, and of the complexity of meaning within painting, that Richter notes, continues to be of central importance to Ansted. 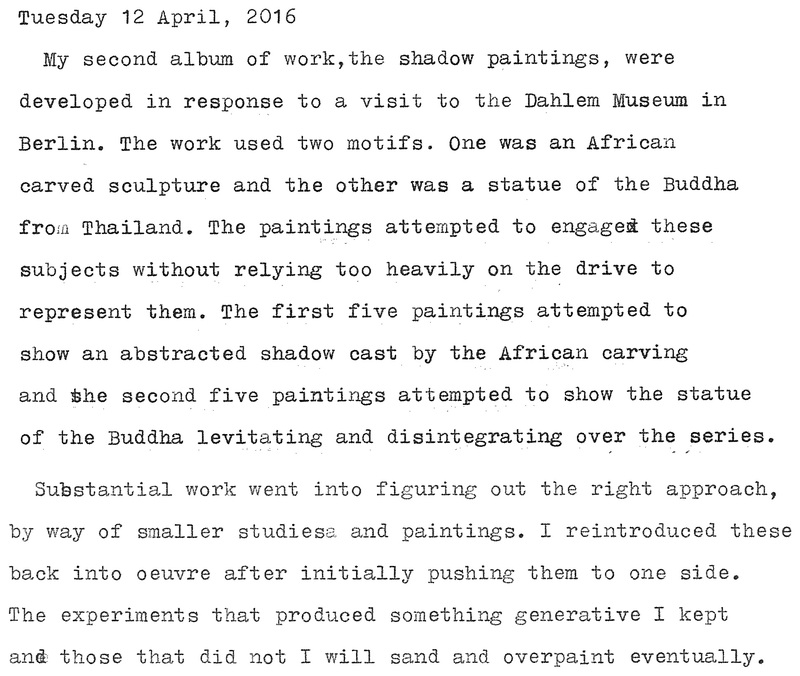 The shadow relations between actually existing objects, present in a real world, and their implications for painting, politics and thought, however comes more to the fore. In Ansted’s Shadows of 2012 there is no visible object, instead a vague shadow is suspended, moving above a mottled ground. The sources of these works, two objects in the vast collection of the Ethnologisches Museum in Berlin, have evaporated. It is as though they disappeared as they moved from their cultures of origin and now exist simply as umbral evidence, bare hints of what was: re-presented in the museum they are incomplete and lost. In visiting the museum, Ansted had been struck by the ‘nakedness of the museum’s culturally displaced objects’, by their presence as echoes of another culture, time and place, and by the complex task involved in ethically representing that very different setting. The objects stood in for, were evidence of, a vast and distant otherness. Ansted was asking if ‘the “toolkit” of modernism… might not be recovered, and… recalibrated’ towards ‘a goal of ethical representation’? Tradition is typically torn asunder as objects move into the museum. Yet, one may hope for some redemption—that those encountering them may take up Walter Benjamin’s call, realising ‘the shattering of tradition… is both destructive and constructive; or, rather, it is initially destructive and so potentially constructive.’ This possibility can only be approached uncertainly, though the museum and its shadows remain alluring: there is promise here and the ghosts in Ansted’s paintings remain potent ones. In the more recent series of 2013–2016, Displacements, Structures and Puzzles, the architecture of painting, and of depicted space, has become more evident. Ansted is the son of an architect, the art school he attended as a student was closely linked with the university’s school of architecture, and structure and the architectonic have always been significant to his work. 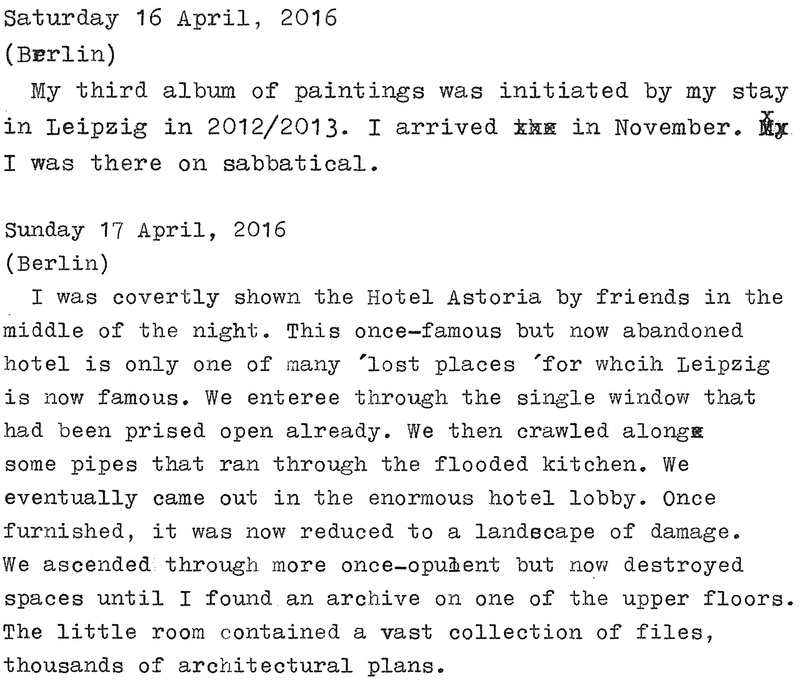 In 2012–2013 he was a resident in the Leipzig International Art Programme, and this period was important and influential also, as he elaborated his practice and dealt with new challenges and questions. In these paintings he conjoins abstraction and figuration, combining the under layer of painting and guidelines of perspective—formal structural devices—with references to actual spaces and places, ones of both physical and psychological presence. The paintings are layered, with coloured grounds and charcoal perspective lines very apparent, even as slabs of loose colour and gestural brush marks applied over them create a liquid, ambivalent space. They allude to both hard edge abstraction and the representation and deliberate modelling of urban spaces within much earlier historical painting. Ansted has been influenced by a certain vein of surrealism, invoking the urban and industrial landscapes of northern Germany and entering discussions with new peers in a very different setting than at home in Perth. In paintings from the Displacements series, like Borna, 2013 and Spinnerei, 2014, Ansted seems to not only be working through the industrial architecture he encountered in Leipzig, but also his intense interest in the painting he saw there, which attempted to reject some of the febrile anxiety present in much of the contemporary art world, and to find alternatives in allying tradition with modernity. These paintings vary greatly in scale (the former small and on board, the latter much larger and on canvas). In both paintings big, complex shapes dominate the foreground, with detail revealed by remnant lines and areas of the under painted ground of the painting left visible. In Borna a large building is evident, revealed by a series of windows and beams of light which appear to originate on its roof. It is detached, a leftover in an otherwise uncertain space. Spinnerei is less clear, with only a small, shadowy and burning building and a small stationery spinning top (or kreisel in German) evoking the spinning mill of the title. All else becomes graphic brushwork and overlaid shapes, almost like collaged cut-outs. But the spinnerei in this painting is a surreal building, an old cotton mill and the new home in Leipzig of the residency program Ansted was participating in. The painting has at its centre an isolated piece of a past industrial architectural history that is also the actual location where the artist was then painting. The Structures works similarly isolate architectural elements and spaces from the fabric of their settings in Sydney. Form, the buildings and their elements, are more obvious yet the space becomes labyrinthine. There is no pathway through these works, they are precisely delineated but dreamlike. While the group started with a palette and density that was similar to the Leipzig paintings, the paintings gradually became less dark, less situated in a northern European winter and more in the light of Australia. 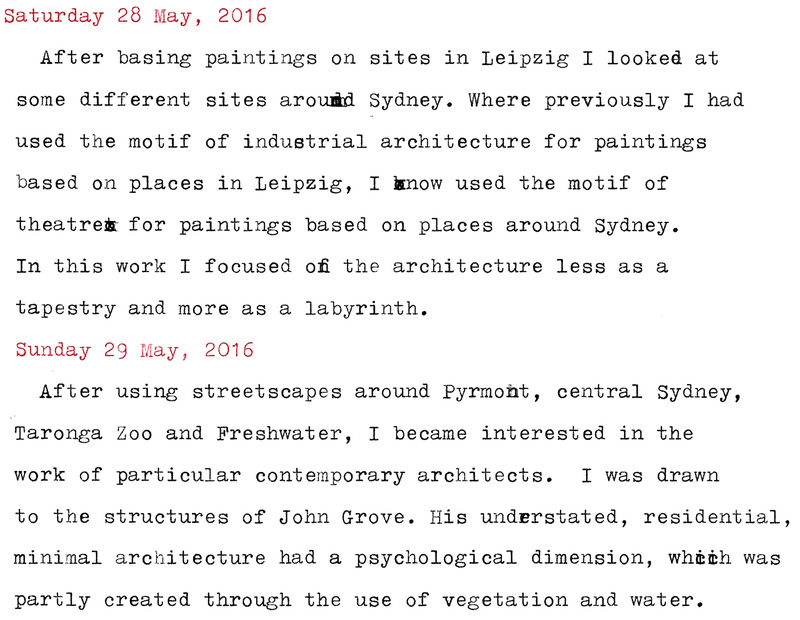 Ansted began at this point to work with images derived from a house designed by Sydney architect John Grove. The group of three Grove House Window paintings (all 2014) cut between the interior, with intersecting beams and surfaces, and fluid, vegetal planes outside the windows. The subject here is a single, domestic building, with a vital exchange between the interior and the garden outside. Here this dialogue is of primary psychological importance, in contrast to the wider and laden public territories of the previous paintings which emphasised the social and exterior. In Ansted’s ongoing Puzzles paintings there is a single monolithic building. Its slab sides, flat roof and planes of colour work together to create ambiguous spaces, with large forms and strange inversions. In these paintings space is spread across a perspectival grid. This grid is employed not self-referentially, not as arbitrary or eliding anything else, including doubt and the complexities of a world beyond. It points to structures underlying the visible and to sub-surface dream spaces within the paintings. In recent times Ansted has created a schema within and for his paintings—establishing the formal structure of a catalogue raisonné, making decisions on what to include or delete, but also a system which allows for very different styles and subjects to co-exist in fruitful relations. His early paintings were clear, overt in their statements, while latterly skepticism and doubt, which are fundamental necessities of faith or aspiration have greater presence. Modernity, the intellectual structure of the 19th and 20th centuries, in which the industrial revolution reached its apotheosis and spinning mills were built; under whose aegis objects were collected, classified and exhibited in great museums; in which rationality (whether of arrays of colour, or of a precise and coherent architectural practice) became a central value, had at its core a glorious goal, of clarity, purpose and truth. For art now that goal seems unattainable but still evocative, still we feel its powerful pull. Ansted’s paintings are of layers, traces and ghosts, and that appeal, and the draw of a painting that is not an endgame but which has real, continuing importance, remains fundamental. 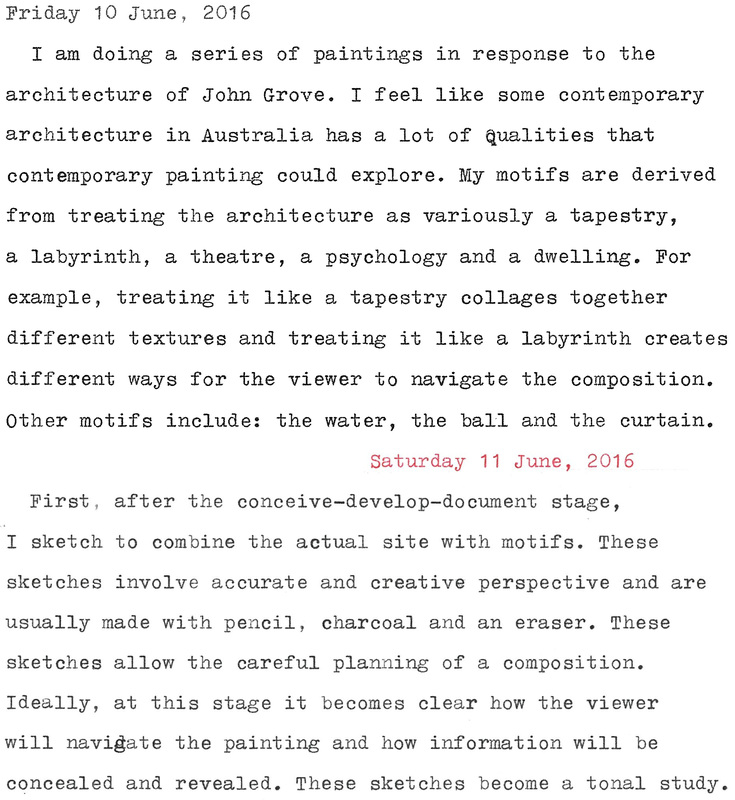 John Barrett-Lennard is a critic and curator, and Adjunct Associate Professor of Art History at the University of Western Australia, in Perth. All photos, images and texts used on this website are protected worldwide by copyright laws. Any use of these images and texts – particulary the downloading, processing and dissemination for commercial and personal purposes, is not permitted. 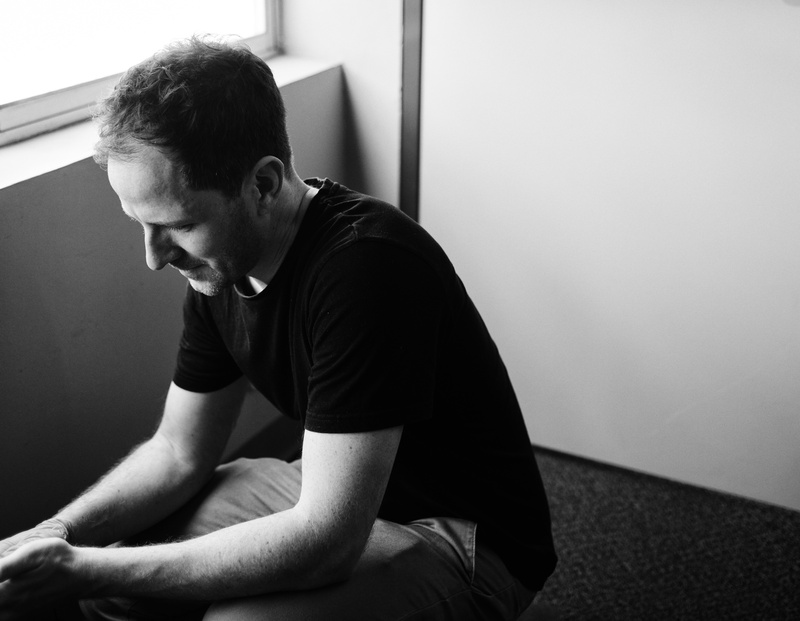 All photos by Rob Frith—except CR 6 by Darryn Ansted and CR 23 by Casey Ayres.